The other day I was walking down 11th and saw this sign on the old Bi-Rite store at Park Rd and 11th, 3400 11th St NW, which is caddy-corner from Red Rocks. There were a lot of rumors about the place, that the Warehouse art space would be going there and so on. Warehouse's move fell through, and I'd been hearing that the owner of Asylum in Adams Morgan was looking at it. 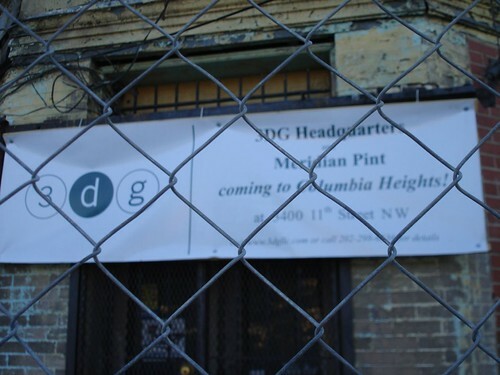 Meridian Pint will occupy the entire ground floor and a portion of the lower level. Owner John Andrade, who has co-owned Asylum in Adams Morgan with his brother since 1991, plans to offer an American comfort-food menu with a generous vegetarian/vegan section; 20 beers on tap with an emphasis on Belgians; and a wide selection of wines and mixed drinks. The lower level will feature a lounge and bar area, and DJ entertainment is contemplated. The top floor will be office space, with 3DG's offices and a travel company, Solimar, located there. Here's the full release on 3DG's website. The company also worked on Comet Rocket Bar in Chinatown, which is a pretty cool spot. Sounds like a great addition to the hood. I'll try to get more info from Asylum and 3DG, such as timetable, plans, etc, so stay tuned. 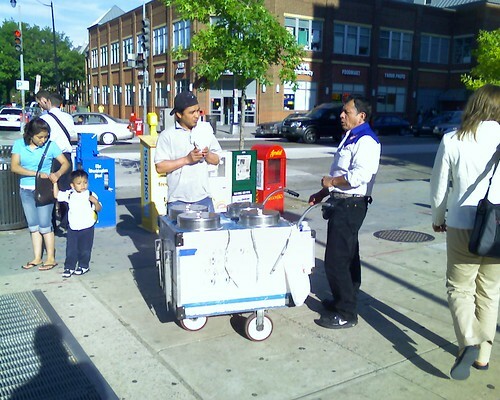 As promised, I looked for the snow cone man today at the Columbia Heights Metro, and he was there. He said he'll be there every day between 3 and 7. Pretty cool. He had four flavors: coconut, mango, cherry, and rainbow. I got rainbow and it was quite good. 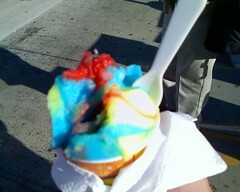 It's more of an Italian ice than the big-chunk-of-ice style sno cones. I'm glad to see it, and I know I'll be buying more in the future. This is awesome. I saw this yesterday around 6:15 pm. I didn't see an actual snow cone, but I assume they are similar to the ones in Adams Morgan, which are tasty. I hope this guy is there frequently, it'd be a great snack on the way home from work. I'll see if he's there today, and I'll talk to him if he is. Ward One councilman Jim Graham posted an interesting thing on the Third District Substation listserve today, saying that ridership at the Columbia Heights was up 24% on weekdays and 39% on weekends - something that anybody who's been in the neighborhood for awhile has probably noticed. He notes that the parking garage at DCUSA is usually only about 25% full, meaning not many folks are driving to the store - good news for those people worried about traffic. Graham also said that the Target had the second largest opening day of all stores in the country, and that 80% of Target employees live in DC, with 25% in Ward 1. Good to hear for Metro and for the neighborhood. 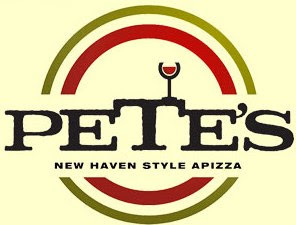 Mike Wilkinson of Pete's Apizza let me know that the Post has a review of the eatery by Tom Sietsema. Wilkinson called it "fair and generally positive" and told me that "things are going great." And as mentioned before, Pete's has beer and wine now. In addition to the Italian wine - five reds and five whites - Wilkinson said they added a prosecco (bubbly) and a rose, and that they currently have Dogfish Head 60-minute IPA, Shiner Hefeweizen, Yuengling, and Sierra Nevada on tap. In bottles they have Miller Lite, Magic Hat #9, Wolaver's, and Sam Adams. Some of us New Columbia Heights bloggers and friends went up to Petworth yesterday to check out the Prince of Petworth's happy hour. We met the Prince, who was a nice guy, and enjoyed the bar - if anybody hasn't been, it's worth a visit or three. 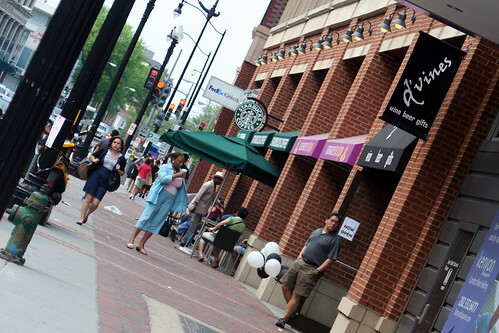 It's located at 3634 Georgia Ave NW, near Otis Place, not far from the Petworth Metro or Columbia Heights proper. The place was formerly called Temperance Hall (because it really was a temperance hall back in the day) and is a neighborhood fave. The owner of Wonderland bought it a little while ago, hence the name change (see the theme? ), but as far as I can tell, there haven't been many changes. It's dark and moody inside, a nice pub atmosphere, and they have a good selection of beer, specials, and food - everybody raves about the garlic fries. There's also a back (downstairs) beer garden with a bar and picnic tables, which was a good place to hang out despite the chilly weather - they have those big heat lamps. The place has a friendly neighborhood vibe, a bit like a slightly fancier, less crowded Wonderland. Cool spot. And stay tuned for a fun announcement from there in the next week or so. We try to be non-partisan here at New Columbia Heights, but this is a cool event. Wonderland is hosting karaoke in front of a live band tonight for $20, with the proceeds going to the Obama campaign. The band is local cover band Northeast Corridor, and the jams start at 8. I assume you can go and watch for free. Here's the City Desk on a previous Rock for Obama event. They say the band "plays songs we all know the words to," so you might not be able to do that song off My Bloody Valentine's first record or whatever. And if you know of any cool events for Hillary or McCain in the hood, let me know. We don't discriminate. D'Vines is obviously not your average corner store - there's no hot dog buns or Rap Snacks or vienna sausages - just good beer and wine. It's open every day, and has a great selection of microbrews and fancy import beers, mostly $7.99 and up per six-pack. They also have some cheaper stuff, like Yuengling for $5.99 and Whitbread Pale Ale for $6.99. You won't find a Busch 30 pack, but you will find the latest Sierra Nevada seasonal, and the staff is very knowledgeable and helpful - if you're looking for a certain taste or something similar to another beer, you're in the right place. They also have lots of wine. D'Vines is at 3103 14th St NW. Here's their website, my post on my first visit, and their Yelp page. --Mayorga's coffee shop has a new juice bar and salad bar. For the juice bar, you can choose various fruits and they make a drink out of them. --Sticky Fingers is hiring part time baristas, bakers, and prep people. --Staples in DCUSA opens May 24th. White, Yuengling, Dogfish Head 60-Minute IPA, and Dominion Lager. Because we just obtained our license today, we probably won't have a full Friday night's supply of all four brews, but rest assured we'll be restocked tomorrow. We're also working with a distributor to offer a selection of bottled beers starting next week, including a great Italian summer favorite, Peroni. Stay tuned! On the wine side, we have five reds and five whites, all Italian, with a range intended to match the flavors of your meal, from light and summery to fruit-bomb reds. We'll publish a detailed list shortly. Pete's has been open for three weeks now, and we are most grateful for all of the support and kind words. If you're from Connecticut, make sure to tell us! We're beginning to keep a map highlighting the town of origin of out Connecticut guests! I went back the other day for lunch and had the chef's choice, which was artichoke, tomato, and olive - pretty tasty. Here's my review from a few weeks ago, on their first day. They're open Sunday-Thursday from 11A-10P and Friday-Saturday 11A-11P. I saw this on a truck parked on 13th the other day. The truck had Maryland plates a ton of tickets on the windshield, some old and crusty, so it must have been there for some time. 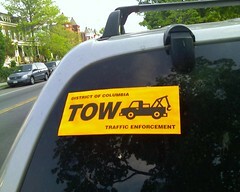 So you better pay off those tickets, or move your car if you keep getting them. I went to the Mt. 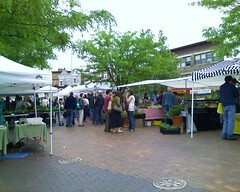 Pleasant Farmers Market on Saturday, it's worth a visit. A bunch of stands are squeezed into the triangle between Mt. Pleasant Street, 17th Street, and Lamont. There were a bunch of area farmers, lots of produce, cider, and baked goods, as well as a guitarist with a great voice. Also on hand were sausage sellers and folks selling herb plants and such. Well worth a visit, and it's right near Heller's Bakery, which is a good spot for your morning coffee and pastries. The Farmers Market is open every Saturday from 9 am to 1 pm, and there's even an "ATM" where you if you don't have cash, they can charge your credit card and give you tokens in return. I'm starting a new series on the blog called Beer Run, where we'll go to stores in the hood that sell beer and rate them on selection, price, and ambiance. 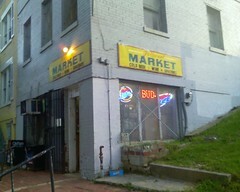 Today's beer run was Fairmont Market at 11th and Fairmont. The store was a bit grimy inside and small, but had a pretty good selection - for example, Sierra Nevada Pale Ale, Dogfish Head 60 Minute IPA, a Bass 22-ouncer, the usual Yuengling and Miller, a selection of 40s and Sparks, and more. Prices were a bit high however - $7.99 for most fancier sixpacks, like Sierra Nevada, and $6.29 for Yuengling. We got a 12-pack of High Life bottles for about $13. The store was pretty crummy inside, but the cashier was really friendly. 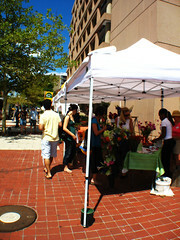 If you can't wait for Ellwood Thompson's, head to 14th and U tomorrow from 9 am to 1 pm for the U Street Farmers Market. The market has produce, meat, dairy, and other stuff from area farmers. It's in the plaza next to the Reeves Center, right on the corner, and will be there every Saturday. The City Paper notes that they have cheese, bread, and even goat. If I get up early enough I'll head down there. A couple weeks ago I tried to order Papa John's to no avail. For all of those Papa lovers, they just opened a store at 14th and Otis delivering to our hood. A guy was passing out a flyer at the Metro with a grand opening deal, a large 2-topping for $10. Not bad. It's available until May 31. The store is at 1417 Otis Place NW, phone 202-667-7272, and you can also order online. 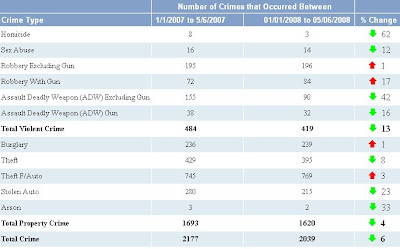 A New Columbia Heights blog query of DC Metropolitan Police Department crime statistics shows a drop in almost every category of violent and property crime, except for one notable exception: Robbery with a gun. The DC police website is surprisingly friendly to those seeking data about crime statistics in the District. There are lots of conflicting theories bouncing around about gentrification and crime in Columbia Heights. Some of the notable ones are 1) with gentrification, crime will decrease with greater neighborhood prosperity; and 2) the increasing income disparity as new wealthier residents move in next to less economically prosperous older residents may drive up crime rates. So I decided to test them with the violent and property crime data for police district three which covers Columbia Heights, Mount Pleasant, Adams Morgan, parts of Georgia Petworth, Reed Cooke, Shaw and the U Street area -- essentially most of Ward One, represented by Councilman Jim Graham. The data doesn't settle either theory to rest definitively, but is worth a look. Overall -- compared to the same period last year, January through early May -- violent crime is down 13%, not an insignificant drop. Yet robbery with a gun is up 17%: Evidence of greater income disparity driving muggings? The statistic itself isn't enough to go on alone. Property crimes only see a slight drop, except for almost a quarter fewer stolen cars. The arson numbers also see a big drop, but there are so few, the drop is statistically insignificant. 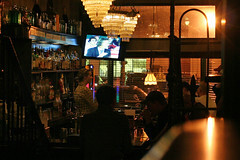 Wonderland, the neighborhood favorite bar over at 11th and Kenyon, has finally updated their website, which is pretty cool. Before it seemed kind of half broken, with hard to find links and things. Now it's nice and clean, with happy hour deals, photos, and so on. Now if only the Monday trivia night weren't so crowded. 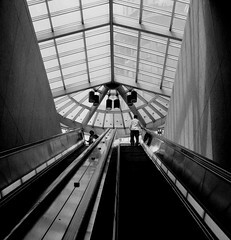 Thanks to DCist for the update. A new grocery store is closer to moving into DC USA. I wrote last July on DCist how Ellwood Thompson's, a Richmond-based grocery store, was looking into opening a location in the DC USA shopping center. I've been following the story since then and just got in touch with the store's CEO, Ryan Youngman, who told me they're "hard at work on a lease" and "we don’t have an announcement as of yet, but we are hopeful that we are moving in the right direction." The store carries a lot of organic and free-range products, buys a lot of its meat and produce from local farmers, and has a lot of standards for their products. Youngman said they "have a general framework for the space layout that works for the both of us" (the store and Grid Properties, DC USA's management) and that the "behind the scenes folks (lawyers) are now hard at work get the details hammered out." He added "This doesn’t mean however 'it's a done deal'. So many things go into this process that it’s just not done until it is…" He said he didn't want to be overly confident about the process and disappoint the neighborhood. Youngman added that they've been thrilled by the support from the Columbia Heights neighborhood, and said they "hope to have a announcement of some sort very soon." No timetable, and it's not a done deal, but this sounds good! The Vitamin Shoppe at 14th and Monroe in DCUSA opens today. This is one store that I think might not last very long. 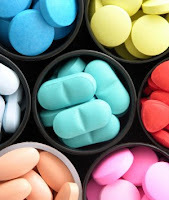 Will people go to Vitamin Shoppes, with a Target, Giant, and CVS right nearby? It seems like this kind of place would require a lot of foot traffic, which the area doesn't really have. Yet, at least. In any case, it's open. Anybody else think it might not last long?